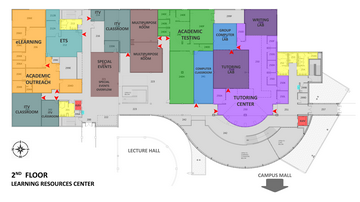 Campus Map: The LRC is located on the east end of campus. It is identified as Building 5 on the campus map. Visitor Parking: Building visitors who are not students may park in Student or Accessible parking spots on the south side of the building. The Learning Resources Center (LRC) is located on the east end of campus which is the end opposite the Student Center. The LRC offers a variety of areas for individual and collaborative study, meetings, events, relaxing, and visiting. Our College and building staff want you to have a good experience. We want the building to be accessible and meet your academic needs. Please let one of our staff members know if you need assistance. While several of the areas in the building are designed for informal, come-and-go access, some must be booked ahead of time. We use an online booking system to manage room reservations and make room availability publicly accessible. You are welcome to contact the LRC if you need help with the system. The Library provides access to circulating and non-circulating materials, textbook reserves, study rooms of various sizes, reading/study areas, and an open computer lab. Ask at the Ask Here desk if you have a question. The Library occupies most of the 1st floor. Academic Testing administers tests at the request of instructors for math and science courses, Internet and hybrid classes, make-up tests for campus courses, advanced standing tests, and computer proficiency exams. Correspondence testing is done by arrangement only and requires special permission. Academic Testing is located in the middle of the 2nd floor. 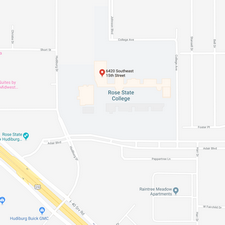 The Tutoring Center provides tutoring services for most general education courses to all Rose students and to local high school students as tutors are available. 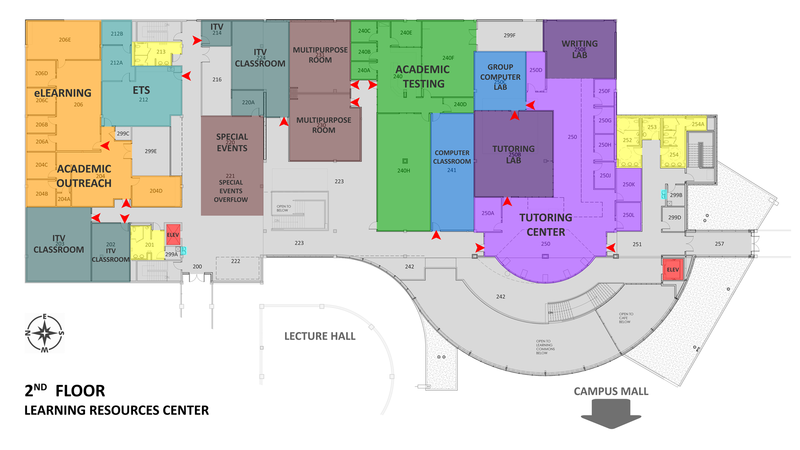 The Tutoring Center is located on the south end of the 2nd floor. eLearning provides instructional design and technology support to faculty who wish to build quality on-campus, online and blended courses. This is the area that administers and manages the Brightspace (by D2L) and Canvas learning management system. They also support the operation of the Rose eLearn Support Helpdesk. 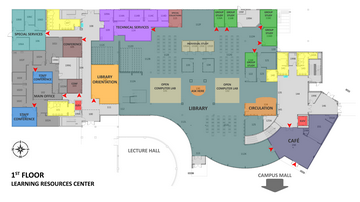 eLearning is located on the north end of the 2nd floor. Academic Outreach primarily serves high school students from area high schools and incarcerated students at state correctional centers who are enrolled in college courses. Academic Outreach is located on the north end of the 2nd floor. Special Services includes Counseling and Disability Services which provides assistance to students and faculty in arranging appropriate accommodations and offers counseling services. Special Services is located on the north end of the 1st floor. Underground Coffee is a locally owned and operated coffee shop with 3 locations in the area. The Underground Coffee (Rose) location is at the south end of the LRC in the corner that faces the campus mall. LRC resources, primarily, serve the academic needs of our students, faculty and staff. We strive to make as many of these as possible available to the general community. Visitors to the Library may browse our print and electronic holdings. In addition, we have several computers available for guests to use. Ask a staff member to help if you have questions. Copyright © 2018 Rose State College. All Rights Reserved.